A UNTV advocacy dubbed as “Caring for the Elderly”, patterned after Bro. Eli Soriano’s humanitarian projects for senior citizens and widows, has recently received the Best TV Public Service Announcement award from the Kapisanan ng mga Brodkaster ng Pilipinas (KBP). 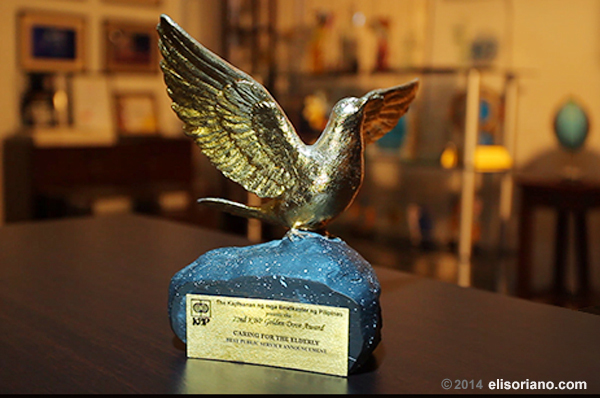 KBP cited The Public Service Channel’s campaign during the former’s Golden Dove Awards ceremonies last April 29, 2014. It was the third such award for UNTV from KBP after previous years’ citations for its anti-smoking and anti-drugs advocacies, respectively. Like Bro. Eli’s project for the elders and widowed members at Members Church of God International (MCGI), UNTV’s advocacy is aimed at promoting the welfare of this marginalized sector of the society through awareness-raising campaigns and charities. UNTV and MCGI have jointly mounted charitable works previously geared for elders, namely their free medical services and free train rides services. ‘Caring for the Elderly’ is a campaign that aims to raise awareness about the rights and privileges of senior citizens, an aim shared by the Expanded Senior Citizens Act of 2003 or Republic Act No. 9257. In the Philippines, individuals who have reached the age of 60 years old and above are considered senior citizens. A minority, the elders of comprised about 6.8 percent of the country’s population. But even in a country like ours, where close-family ties is a long-held practice, abuse and neglect of the elderly remain a reality. Statistics revealed that abuse of the elders, ranging from physical to emotional, have a 85% tendency to be inflicted by their own family members and relatives. In a 2008 National Statistical Coordination Board report, only less than one percent of the total population of the elderly, together with the disabled, children and women, receive services from the country’s social welfare and development department. For his part, Bro. Eli sees to it that Church members are constantly reminded of their obligations to the elderly populace, often citing the Bible verse James 1:27. 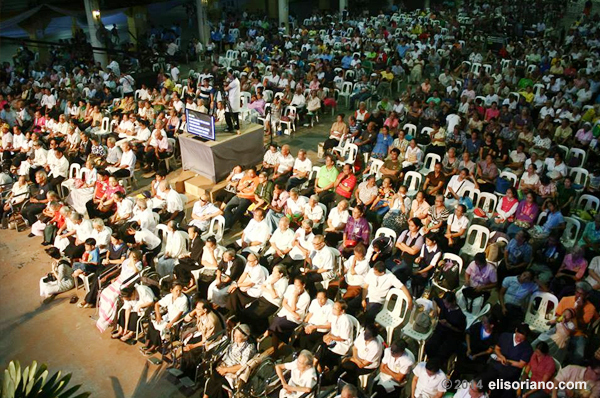 Charities for the aged members that MCGI maintain include the Charity Home for the Elderly, a home for the aged-like institution whose first branch was established since 2005 in Apalit, Pampanga. The charitable institution accepts Church members who belong to the senior citizens criteria of the Department of Social Welfare and Development. But even non-members, whom the Church determined to be neglected and abandoned by their own families, are also admitted in the Charity Home. Moreover, other charity homes for the elders were also opened in key areas across the country to cater to more abandoned senior citizens. Bro. Eli makes sure residents of the charity home regularly receive free meals, clothes, vitamins and medical assistance from MCGI. Daniel Razon, Chairman and CEO of Breakthrough and Milestones Productions International (BMPI), came up with the idea for the campaign similar advocacy and projects of Bro. Eli through MCGI. BMPI serves as UNTV’s content provider. Also more popularly known as Kuya Daniel, he is incidentally Vice-Presiding Minister to MCGI. Then during the anniversary celebration of Ang Dating Daan program, Kuya Daniel announced that UNTV will celebrate its 10th anniversary by honoring the country’s senior citizens. Public services focused on providing the needs of the senior citizens will be the highlight of the anniversary of UNTV in July this year.